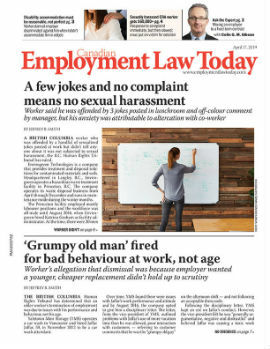 An Ontario McDonald’s employee had her employment terminated not because of discrimination from a back injury-related disability but rather because the employer simply couldn’t find work for her, the Ontario Human Rights Tribunal has ruled. Cathy Gahagan worked at the grill station of a McDonald’s in Lakefield, Ont., for seven years. Her duties involved assembling burgers, wrapping them and taking them to the front of the restaurant for customers — a key position in the fast-paced kitchen. In May 2009, Gahagan twisted her back while lifting a filter pan from underneath the french fries vat. The injury caused her to miss work and she was granted full loss-of-earning benefits by the Ontario’s Workplace Safety and Insurance Board (WSIB).